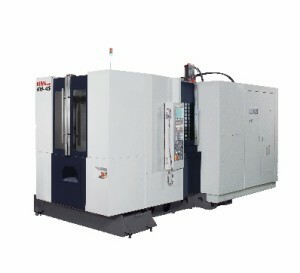 Delaware Metals has added a new Lathe to deliver on faster CNC Turning Services. The Victor Taichung VTurn 26HD specifically adds more capacity for increasing demand. This machine has boxway slidways for heavy duty service. Its belt driven high rigidity & high precision spindle allows for faster turnaround. We are continually expanding to capacity to service our new and existing customers. Delaware Metals has completed its certification to ISO 9001-2015 standards. The scope of certification is for the prototyping, precision machining, fabrication and assembly of metal and composite materials for aerospace, automotive, medical device and pharmaceutical applications. We are committed to quality manufacturing of parts for these and other industries. Delaware Metals, located in Newport DE, specializes in precision parts made from Metal and Plastics Materials. We have machinery to handle the most demanding specifications, including 5-axis CNC Machining capabilities with our Kiwa Horizontal Machining Center. Additional capabilities include Contract Manufacturing, Precision & Prototype Machining, Repair Services, Fabrication & Assembly, EDM and Machinery Build and Repair Services. While Aerospace and Aircraft Parts require precise measurement and control, we have been consistently servicing this industry since our inception. Our Quality Assurance procedures comply with the requirements of ISO 9001:2015. We achieve manufacturing excellence by encouraging and expecting the creative involvement of all employees, by listening to our customers and meeting or exceeding their needs. Check out our video for more pictures of our new Kiwa 5-axis machining center. 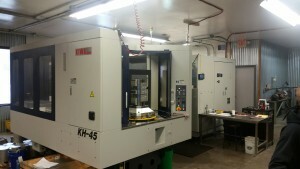 Earlier this year, we installed our new 5-axis Kiwa KH-45 Horizontal Machining Center. Now fully operational, this machine tool gives us increased capacity to service our customers. 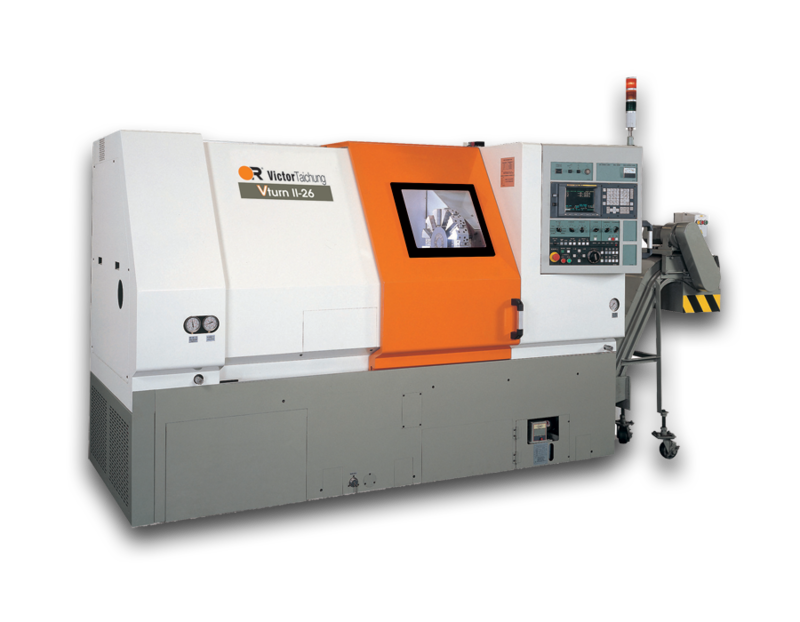 Featuring the added Pallet Pool for fast job/part changes and 5-axis machining, this powerhouse enables machining of large quantities of parts in less time. Delaware Metals recently completed a project for a customer in which they provided high speed drilling of over 250,000 total holes on 200 parts. This project provided a unique challenge which we were able to meet, reducing the time to drill each hole from 25 seconds to under 3 seconds each. This time savings resulted in large cost savings for our customer. For this project we used a high speed CNC Machining center utilizing the latest drilling techniques. The drilling was on a carbon steel tubing part that included threading and knurling as well. Coming soon to Delaware Metals, expanded capacity in precision and throughput with the addition of our new Kiwa KH-45 Horizontal Machining Center. Already on order, and set to arrive in early October, this six-pallet horizontal is just the beginning of the planned upgrades happening at Delaware Metals in the near future. We have added a new Tube-End Forming Machine that enables us to expand and/or reduce the ends of tubing. We can expand/reduce tube sizes ranging from ¼” to ¾” and can do flaring up to 1-¼” diameter and can do so in many types and grades of metal. We recently did a project for a customer expanding one end of 30,000 pieces of 3/8” diameter stainless steel tubing so the new ID was a nice slip-fit on the OD of the same tubing. 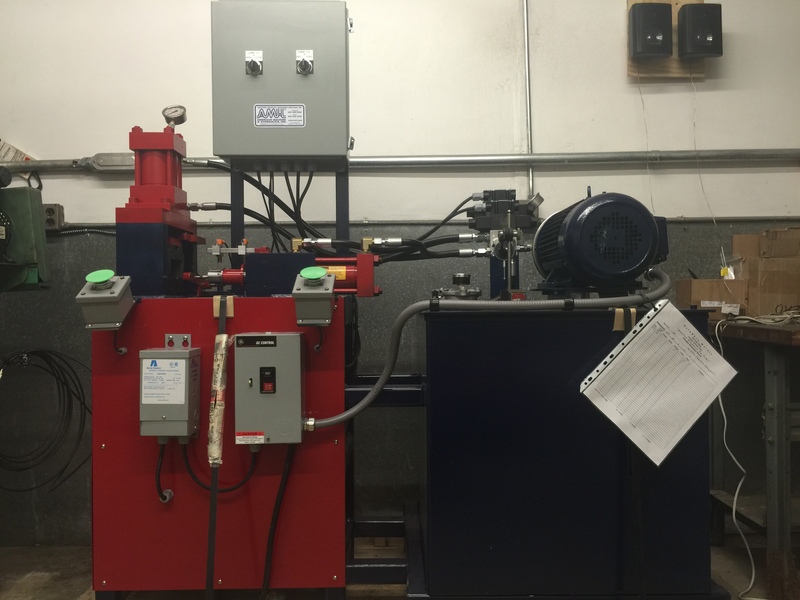 This machine adds to our overall capabilities and we are committed to servicing our customers, both old and new, and continue to update our shop to meet their requirements. Delaware Metals machines exotic plastics and metals to our customer’s specifications. We can handle a variety of materials that other machine shops do not work with due to their properties. 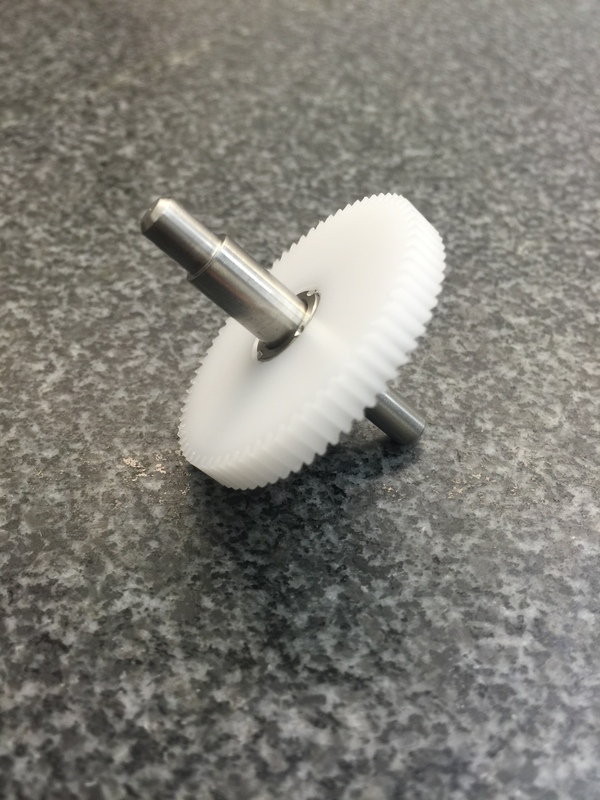 Sometimes the materials are a little more familiar, in this case gears made from Delrin® and then installed on a stainless steel shaft. These parts are made in-house with CNC machines. We then assembled the parts for shipment to our customer. The gear assembly will be used inside a gear box for the agricultural industry. 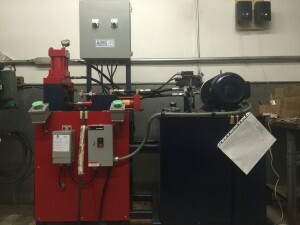 Delaware Metals machines exotic plastics and metals to our customer’s specifications. We can handle a variety of materials that other machine shops do not work with due to their properties, machinability and/or cost. One such exotic plastic we frequently machine is Polysulfone. Polysulfones are a family of thermoplastic polymers. These polymers are known for their toughness and stability at high temperatures. 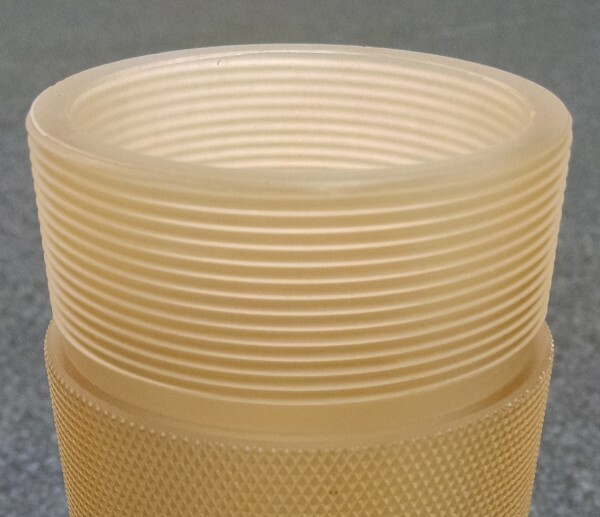 Due to the high cost of raw materials and processing, Polysulfones are used in specialty applications and often are a superior replacement for polycarbonates. Delaware Metals uses their extensive knowledge of this material to produce all sorts of specialty bushings and products. If you are having troubles finding the best materials for your project, give us a call. We have the knowledge to help you pick the right material, and the technology/skill to machine it.